FRANKFURT -- BMW, Volkswagen, Daimler and Ford plan to build a network of ultra-fast charging stations in Europe as they look to stoke demand for electric cars and break Tesla's stranglehold on the market. The consortium has begun talks with possible partners over plans to build about 400 next-generation charging stations in Europe that can reload an electric car in minutes instead of hours. The automakers signed an initial agreement to work together in November. The long time it takes to charge batteries is one of the main disadvantages of electric cars compared to conventional cars with gasoline tanks that can be filled up in seconds. Until now, drivers of electric cars have had to leave their vehicles plugged in for hours at a charging station for a journey between cities, making many long-range journeys impractical. Installing new, faster chargers would spur the overall market, and also help the traditional car manufacturers close the gap with Tesla, the Silicon Valley-based manufacturer, which maintains its own network of charging stations. Tesla's chargers are the fastest in the industry, and are incompatible with existing EVs made by rivals. The carmakers are involving experts from the European power and engineering industry, including Germany's Innogy, E.ON and Siemens and Portugal's Efacec, which are all working on the technology, people familiar with the matter told Reuters. The new 350 kilowatt (kW) chargers would be nearly three times as powerful as Tesla's. "This is a structured and concerted effort across sectors to tackle the infrastructure issue in a real way," one of the sources said. A spokesman for Ford, speaking on behalf of the consortium, said he expected several energy providers to be part of the planned network, without elaborating further. Tesla's tech billionaire CEO Elon Musk has hinted that the company will not be outdone, tweeting that 350 kW chargers are a "children's toy." A Germany-based spokeswoman for the company declined to comment beyond Musk's remarks. European carmakers believe they are on the cusp of a surge in demand for EVs. Daimler CEO Dieter Zetsche expects electric vehicles will make up 15-25 percent of Mercedes sales by 2025. But first, technicians have to solve the problem of conveniently charging them up. Europe already has a network of nearly 72,000 public charging stations for EVs, but most are so slow they take hours for a meaningful charge. The International Energy Agency says only about 5,800 European charging stations are "fast," which it defines as charging at a rate of 43 kW or more, the equivalent of operating 90 washing machines simultaneously. The fastest chargers in widespread use on the continent so far are the more than 1,800 installed so far by Tesla. At 120 kW, they still need half an hour to give a car enough power to drive 270 km. As the market for EVs grows, traditional carmakers are going to find it easier to catch up with Tesla, said Graham Evans, automotive analyst at IHS Markit. "Tesla doesn't really have anyone to answer to, they are independent," he said. "[But] I think that further out the big [automakers] are in a better position to capitalize because of their more extensive resources." Installing thousands of fast chargers across the globe will require billions of dollars in investment and offer an opportunity to manufacturers. The car consortium's new fast chargers will cost about 200,000 euros ($210,000) each. U.S. market leader ChargePoint upped the ante last week by announcing stations of up to 400 kW that will be available from July. 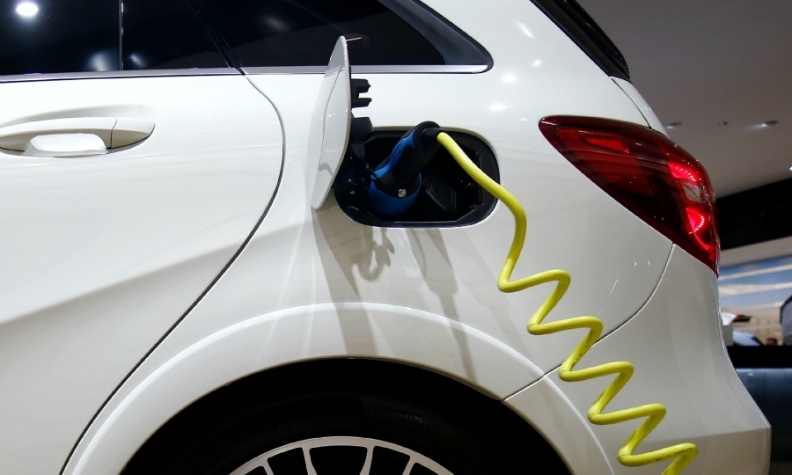 Navigant Research analyst Lisa Jerram said the number of players in the nascent market to build ultra-fast charging stations makes it difficult to call out a winner yet. "Development is underway on these chargers so there isn't a leader at this point," she said. So far, makers of charging stations are focused mainly on getting exposure and market share by installing as many as possible. But sooner or later, investors are going to want to see profits, which means that cost will come to matter more. That holds true even for Tesla, which is starting to adjust its business model as the industry grows up. Tesla cars ordered up until this week have come with free electricity from its charging stations. But owners who order their cars after Jan. 15 will have to pay to power them up once they reach a limit, although the company says the price will always be cheaper than gasoline. "Burning money as a result of the market and technology not being ready is unlikely to be rewarded by shareholders," said Thomas Deser, senior fund manager at Union Investment.